Maida Today: Can This Doll Be Saved? Antique dolls should usually be left alone to wear their stories without help from us. But sometimes a doll has seen a hard life, or has been repainted badly, and needs some help to continue on his or her journey. Fran Renner has such a doll. And so, this will be the first of a series here on Maida Today called, "Can This Doll Be Saved?" 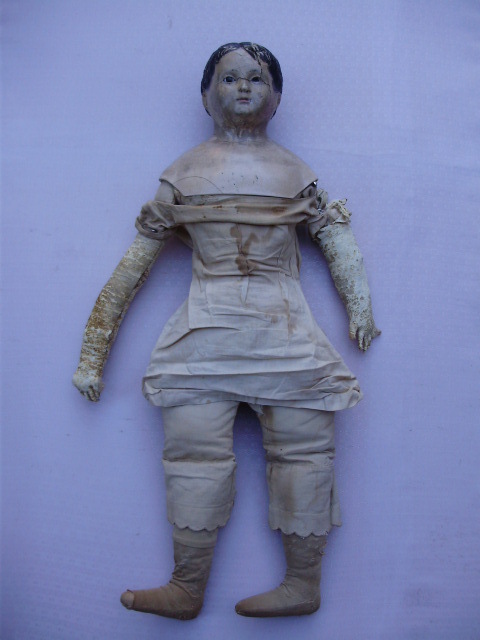 I've been "listening in" to an email correspondence between Fran Renner, the owner of this early papier mache who needs help, and Edyth O'Neill, who has helped many such dolls when it was clear they needed help. "These are the original pictures when I bought the doll. She needs a lot of help. I have stabilized her head and glued her cracks. Trying to find an eye.I've washed and repaired the undergarments and have repaired her arm. I will send more pictures as she moves along. She is a nice size 26 inches long." "Dear Fran - Ah, the Voit child I was bidding on also for a little while. <snip> The body looks good to me, the arms may have been hand stitched of cloth, not leather. Some and some. In those small areas needing filler, you may use the elmer’s wood filler. Try a little bit in one crack and let it dry and sand it smooth with fine sand paper on the tip of your finger, to see if this is what you want to use. Very small cracks can be filled with acrylic Gesso instead. See which you prefer. The eye missing needs to go in behind the face. If you have any thing the right size, use it and paint the center with black fingernail paint. It will be an oval eye likely. <snip> The ceramcoat color I use is Dresden flesh, mixed with antique white or straight." Fran's early papier mache is worth saving. 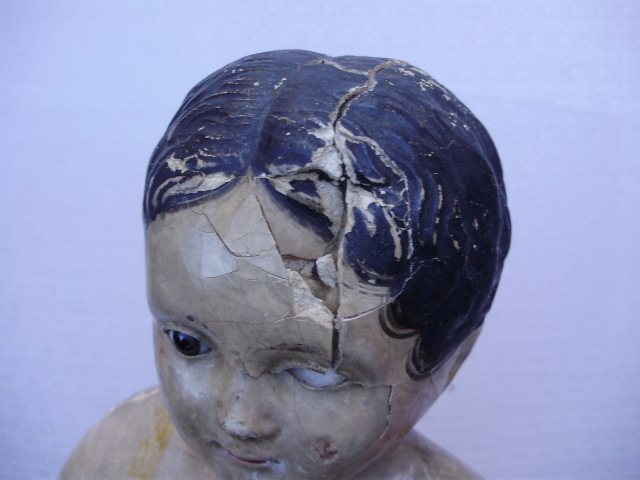 If you have experience with repairing antique papier mache dolls, how would you approach this? I don't have any experience, but I would want to save her! There's wear and experience and then there's this kind of damage, that makes me sad when I see it. She looks unloved, if that makes sense. Yes, I agree! She needs some love, and fortunately she's gone to live with FRAN, who is loves antique dolls. Some good suggestions by Edyth for this poor dollye's repair. I was bidding on her as well...that is the type of restoration challenge upon which I thrive! I've restored/repaired a number of papier maches, both Greiners and Voits- such as this charmer is - and I use paper clay as my filler agent - because it is so very smooth to begin with, and can be further smoothed with water - so no sanding is required. It is also so very easy to sculpt - such as missing noses ( which I did for one of Edyth's doll heads) or imploded forehead and browbone areas such as this dear has experienced. I use oil paints rather than acrylics. Since I only overpaint the repair, I am not concerned about it not being readily removable, as acrylics such as ceramcoat are. I do no in-painting over existing paint. Dollye would have to have her shoulder removed from the good old body to begin the restoration. I would commence this restorative repair by easing the pieces that have been impacted inward to their original position- helping this process along by the application within the head of only very fractionally dampened paper toweling - so that the papier mache head pieces can be adjusted more readily, but not so damp as to cause them to become saturated, as that may cause them to mold or mildew and may also cause them to become soggy...perish the thought! yes, the removal of the shoulderhead is the first thing i would do and press the pieces from within back into their places, rather than fill all that area. the damp cloth allowing the papermache to become a bit softer is a great idea! you want to retain as much of the original surface as possible. for filler i use elmers glue, plaster of paris and sifted sawdust [ very fine ]. then overpaint with water [ not acrylic ] paint very diluted. it dries matte and allows the natural imperfections of the surrounding sufaces to show through. just some ideas.